It is a pleasure for me to write a letter of reference for Mr. Bart Christner, who has expressed an interest in the Applied Sports Institute at Garrett Community College. 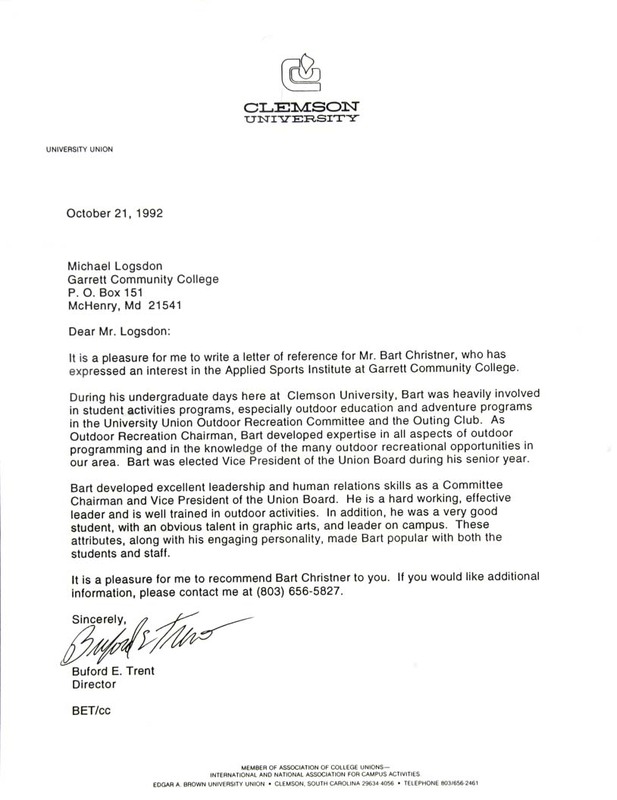 During his undergraduate days her at Clemson University, Bart was heavily involved in student activities programs, especially outdoor education and adventure programs in the University Union Outdoor Recreation Committee and the Outing Club. As Outdoor Recreation Chairman, Bart developed expertise in all aspects of outdoor programming and in the knowledge of the many outdoor recreational opportunities in our area. Bart was elected Vice President of the Union Board during his senior year. Bart developed excellent leadership and human relations skills as a Committee Chairman and Vice President of the Union Board. He is a hard working, effective leader and is well trained in outdoor activities. In addition, he was a very good student, with an obvious talent in graphic arts, and leader on campus. These attributes, along with his engaging personality, made Bart popular with both the students and the staff. It is a pleasure for me to recommend Bart Christner to you. Should you would like additional information, please contact me.